This feature corresponds to rhythmic properties of a musical piece as well as tempo. A tempogram is computed similar to a spectrogram by short-time Fourier transform or using autocorrelation function. It represents periodic occurances of high energy in the waveform and hence is used to estimate tempo and beat positions. To reduce jumps between a certain tempo value and its multiples, a cyclic variant is used where we identify all tempo multiples similar to the computation of chroma from pitch features. Subsequently, the resulting tempo features are quantized, smoothed (in temporal direction), and normalized with respect to the ℓ2-norm. In the spirit of the transposition-invariant chroma-based SSM, we compute something similar for cyclic tempo features also. Although the properties of this matrix are not discovered yet, we present this representation to show that the transposition index carries some meaningful information. We guess that this can be used to separate information about rhythm and tempo. 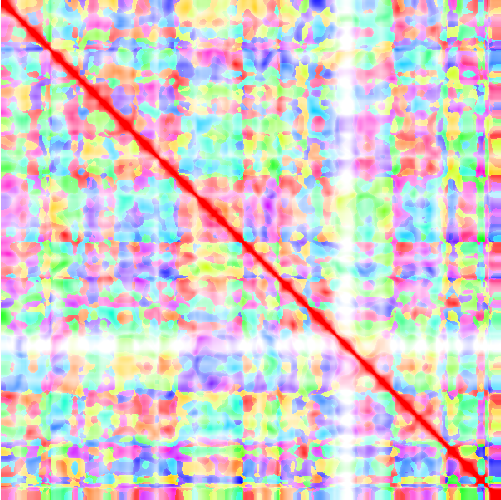 In this case, we use a standard HSV colormap. Geoffroy Peeters: Time variable tempo detection and beat marking, ICMC 2005. Peter Grosche, Meinard Müller, Frank Kurth: Cyclic tempogram – a mid-level tempo representation for music signals, ICASSP 2010, pp. 5522–5525. Peter Grosche, Meinard Müller: Tempogram toolbox: Matlab implementations for tempo and pulse analysis of music recordings., ISMIR 2011.